S I G N & D I G I T A L G R A P H I C S • March 2018 • 167 T TROTEC LASER INC Manufacturer in FABRICATION & INSTALLATION EQUIPMENT, LASER ENGRAVERS, SIGN & WRAP SHOP TOOLS / SUPPLIES COMPANY SAYS: Trotec's SP laser cutters drive productivity with processing speeds up to 6.5 feet per second and laser power up to 400 watts. They offer the largest safety class-2 bed sizes and sophisticated vision registration software, making them ideal for signs. 44747 Helm Ct Plymouth, MI 48170 http://www.troteclaser.com 866-226-8505 ∙ 734-927-6300 COMPANY PROFILE: Trotec Laser is a leading international provider of advanced, high-speed laser equipment for cutting, engraving and marking. 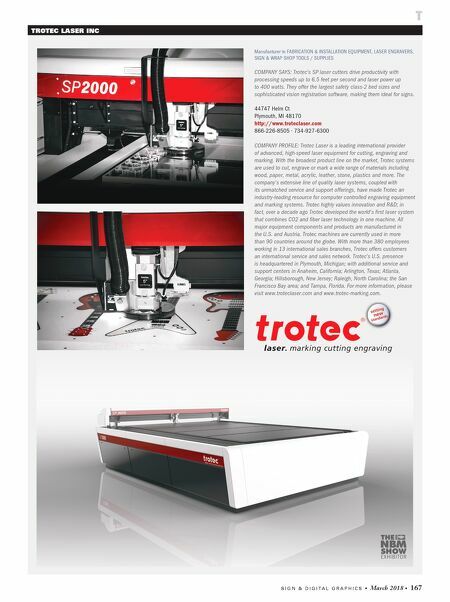 With the broadest product line on the market, Trotec systems are used to cut, engrave or mark a wide range of materials including wood, paper, metal, acrylic, leather, stone, plastics and more. The company's extensive line of quality laser systems, coupled with its unmatched service and support offerings, have made Trotec an industry-leading resource for computer controlled engraving equipment and marking systems. Trotec highly values innovation and R&D; in fact, over a decade ago Trotec developed the world's first laser system that combines CO2 and fiber laser technology in one machine. All major equipment components and products are manufactured in the U.S. and Austria. Trotec machines are currently used in more than 90 countries around the globe. With more than 380 employees working in 13 international sales branches, Trotec offers customers an international service and sales network. Trotec's U.S. presence is headquartered in Plymouth, Michigan; with additional service and support centers in Anaheim, California; Arlington, Texas; Atlanta, Georgia; Hillsborough, New Jersey; Raleigh, North Carolina; the San Francisco Bay area; and Tampa, Florida. 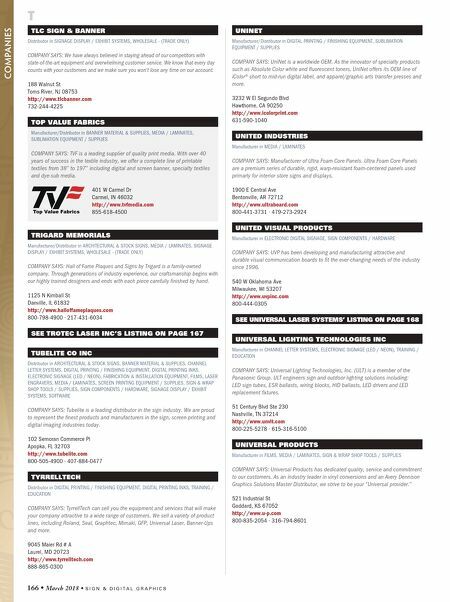 For more information, please visit www.troteclaser.com and www.trotec-marking.com.